A few days ago I wrote about trying to find a printer which works with open source drivers. When discussing the purchase with my parents, they mentioned that they’d like to get a color printer for printing photos and such. So the printer we actually ended up getting for them is the HP CM1312 MFP. It is quite a bit more expensive than the monochrome ones but worth the extra price, IMO. Apparently this printer has Postscript support, which probably helps a lot with Linux support. When I powered on the printer and then booted my parents’ Fedora 11 box, the printer automatically showed up in the “Printers” view (system-config-printer) and printing worked without any extra configuration. HP claims that in order to be able to scan you’d need to download a proprietary plugin, but that’s false. Just make sure you have the libsane-hpaio package installed and that /etc/sane.d/dll.conf includes an “hpaio” line and scanning should work with programs such as xsane and GIMP. Any laser multifunction printers out there with open source Linux drivers? I’ll be updating this post when I get more information about multifunction laser printers with open source drivers. My parents would like to get a new laser printer, preferably an affordable multifunction one – I’ll probably be the one actually purchasing the device. They’re running Fedora 11 and I’d like to get them a printer which would work “out of the box” with open source drivers. They probably don’t even need the scanning features to work, they just need a photocopier and a printer. Here are some of my experiences with various printer manufacturers’ products. If I’m mistaken with some printers, please leave a comment. Canon: These need a proprietary driver. With the printers I’ve tried, it works on Fedora but segfaults on Ubuntu. I’d hate to buy a printer with this kind of Linux support. Brother and Epson: Apparently their Linux drivers are proprietary, I’d rather not buy something that requires a proprietary driver. HP: HP is supposed to have decent Linux support with hplip, which is open source. However, basically all of their affordable (you could also read: cheap) multifunction printers currently on sale require a proprietary plugin according to this page. I’m quite disappointed with HP not providing open source/free software drivers for their current models. So, dear Lazyweb, which multifunction printer out there should I get? On a Finnish Linux forum someone recommended getting the HP LaserJet M1120 MFP, because apparently that also works with the foo2xqx open source driver. I’ll have to see if that one is available in the local shops. Samsung: I had completely forgotten to write about Samsung. I actually own a SCX-4100 myself and that one needs the proprietary drivers. At least in the past the Samsung proprietary drivers were horrible, the installer overwrote system libraries causing Qt apps not to work and all kinds of evil stuff like that. Since then I’ve manually searched for the PPD file, entered it into system-config-printer, searched for the binaries s-c-printer says are missing and copied them into place. All of this hasn’t really convinced me into buying a Samsung MFP again. However, Myrtti mentioned in the comments (thanks!) that the SCX-4200 works with an open source driver, splix. Apparently the SCX-4500 works with the same driver, too. After a day of searching the local shops for multifunction printers and googling like crazy, I’m beginning to think I should just get the HP M1120. Printing should work with the foo2xqx driver and SANE claims to have support for the scanner too. As Tim, the system-config-printer developer, wrote in the comments, foo2xqx isn’t (and won’t be) in Fedora. It seems to be available from the RPM Fusion Free repository, though, and that’s good enough for me. This post is about Finnish language support on Fedora 11 and will be mostly in Finnish. See the first screenshot on how spell and grammar checking for Finnish works in OpenOffice.org with the openoffice.org-voikko extension by the Voikko project. This is to my knowledge the first time an open source grammar checker is available for Finnish and Fedora 11 is the first mainstream distribution to have the feature by default. The second screenshot is the Finnish Mozvoikko spell checking extension for Firefox at work. Fedora 11 julkaistiin 9.7.2009. Siihen ehti juuri mukaan uudet versiot Voikko-projektin kehittämistä paketeista. Tarkalleen versiot ovat suomi-malaga (pakettinimi malaga-suomi-voikko) 1.3, libvoikko 2.1, mozvoikko 0.9.7, joka vastaa käytännössä täysin versiota 1.0 sekä openoffice.org-voikko 3.1. Voikko-projektin julkaisutiedot voi lukea täältä. Sen lisäksi monelle suomalaisellekin käyttäjälle tärkeänä päivityksenä Fedora 11:ssä on OpenOffice.org 3.1. OpenOffice.org-voikko 3.1:n merkittävin uusi ominaisuus on oletuksena toimiva kieliopin tarkistus. Alla toimintoa kuvaava ruutukaappaus. Punainen alleviivaus merkitsee kirjoitusvirhettä, sininen kielioppivirhettä. Suomen kielen kieliopin tarkistus on merkittävä ominaisuus avoimen lähdekoodin tekstinkäsittelyohjelmistoissa, minun tietääkseni tällaista ominaisuutta ei ole aiemmin ollut ollenkaan tarjolla. Fedora 11 on ensimmäinen ns. mainstream-jakelu, jossa kieliopin tarkistus on mukana. Lisäksi mainittakoon, että Mozilla Firefoxin suomen kielen oikolukulisäosa Mozvoikko asennetaan nyt Fedora 11:ssä oletuksena sekä DVD:tä että LiveCD:tä käytettäessä, jos asennus tehdään suomen kielellä tai suomen kielen tuki on muuten valittuna asennettavista pakettiryhmistä. Kuvankaappaus Mozvoikon toiminnasta Firefoxissa. 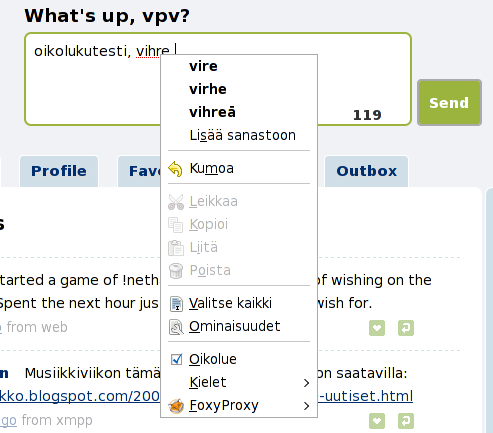 Screenshot of Finnish spell checking on Firefox with Mozvoikko. Valitettavasti Thunderbirdiin ei vielä voida kunnolla paketoida Mozvoikkoa Fedoran mukana toimitettavaksi, koska minun saamieni tietojen mukaan Thunderbird 3 ei ole vielä XULRunner-sovellus. Mozvoikko kannattaa asentaa Thunderbirdiin toistaiseksi Mozillan omasta palvelusta, jonne sen on paketoinut Ville Pohjanheimo. Lisäys: Muistuipa mieleeni vielä sekin, että Fedora 11 on ensimmäinen Fedora-versio pitkään aikaan, joka sisältää päivitetyt OpenOffice.org-suomennokset. Tämä siksi, että OpenOffice.orgin suomen käännösprojekti lähetti päivitetyt käännöksensä äskettäin myös niin sanottuun Sunin “viralliseen” lähdekoodiin. Välissä oli parin vuoden ajanjakso, jolloin vain “epävirallisia” lähdekoodeja päivitettiin ja tällöin Fedora ei saanut OpenOfficen käännöspäivityksiä ollenkaan. I noticed a new NetworkManager/wpa_supplicant/mobile-broadband-provider-info update is now in Fedora 11 updates-testing. This update includes the mobile broadband configuration assistant and the mobile broadband provider database which are based on the work Antti Kaijanmäki did in Summercode Finland 2008. This how the first screen of the assistant looks like. I actually tested the assistant on my laptop with my Nokia E71 and it worked well. Thanks Antti, Dan Williams and all of the other people who’ve been involved in the development of mbca and the provider database. 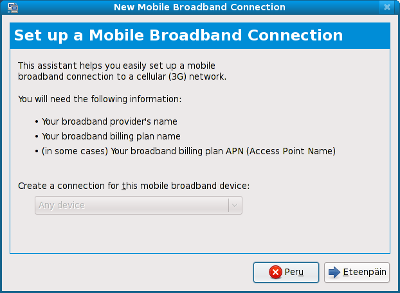 Edit: Here’s Dan Williams’ blog post on the mobile broadband assistant. I took part in the Finnish Linux podcast LinuCast this evening, talking about Fedora 11. I had serious issues with getting the microphone sound working with Mumble. I tested everything yesterday and things seemed to be working. Even during the pre-show talk everything worked. But once we went live on the stream, which is more or less directly recorded as a podcast episode, they couldn’t hear anything but crackle from me. I switched to my laptop while the show was running. Nothing changed. Then I decided to do a one last try with my desktop computer. At that point I figured it out. As weird as it is, I needed to have the Sound Preferences window open while using Mumble. Otherwise the microphone sound would just crackle. Once I opened the Sound Preferences window, everything worked perfectly. The Sound Recorder program was working at all times, no matter if I had the Sound Preferences window open or not. Really weird. When the live show started, I had closed the Sound Preferences window in order to gain a bit more screen real estate as the window can’t be minimized, thus causing the sound problems. Well, I got to say a couple of things about Fedora 11, it’s all in Finnish of course. Once the podcast is released, I’ll put the link on this blog, in case some Finnish Fedora user is interested. Edit: For those who might not be reading the comments on my blog, here’s the bug report Casey filed about this issue. I recently discovered the Virtaal translation tool by the translate.org.za team and I was using Virtaal to do my typo fixes. One interesting feature in Virtaal is that it does spell checking via PyEnchant. Spell checking is something I haven’t really seen in other translation editors, but it’s really useful in making high quality translations. Here’s how (I think) the spell checking stack works when using virtaal. Virtaal uses PyEnchant to call the Enchant spell checking library, which then calls Voikko to do the actual Finnish spell checking. So in TaDD 2009 I’d like to thank the developers of each part of this stack for making my life as a translator much easier. Thank you, developers of Virtaal, PyEnchant, Enchant and Voikko! I just made the change to Fedora 11’s comps file so that Mozvoikko, the Finnish spell checking extension for Firefox, will be installed by default when using Finnish in the installer or when the “Finnish support” group is specifically selected. I could have done this for Fedora 10 already, but I decided to set Mozvoikko as optional instead and see if there would be any problems between Firefox and Mozvoikko. As there weren’t any, I thought it’d be good to have Mozvoikko as default. I’ve also heard other people are working towards getting Mozvoikko installed by default in Ubuntu and Debian when using Finnish, Mandriva is apparently already doing so. I’m not sure about OpenSuse as I think packages can be added to the “core” only by Novell people, but various Voikko packages are available for OpenSuse as well. Mozvoikko is being developed by the Voikko project, in case you want to have a look. When Fedora 9 was released, I wrote a couple of posts about my upgrade experiences. As most readers of this blog probably already know, Fedora 10 was released last week, so I decided to write something about my upgrades to it as well. In general I’ve had very few actual problems. I upgraded my three systems all with Preupgrade. For some reason on at least two systems Preupgrade couldn’t find the Kickstart file, because the text based UI had it wrong even though the grub configuration seemed to be alright. It was looking for something like < drive uuid and path here >ks.c when the correct path was < drive uuid and path here>ks.cfg and so I had to correct the path before it would start the upgrade. I can’t remember the actual details and I didn’t take screenshots so I can’t really make a productive bug report about this. Glitch-free Pulseaudio seems to actually be a bit more glitchy than the Fedora 9 version was. Otherwise it works well, but if I switch songs or start a new song on pretty much any audio player, the first five seconds or so tend to have a lot of glitches. I haven’t yet tried to turn off the timer based scheduling, maybe I should. This issue doesn’t really bother me that much, though. In general Fedora 10 seems like a great release. Fedora 9 had lots of new, leading edge stuff such as KDE4 and PackageKit, Firefox 3 and the new X.org. In Fedora 10 it seems like most of those things have been polished and the distribution is really nice to use. Fedora 10 seems to mostly Just Work 🙂 . I haven’t really gotten to use many of the official new features since I already have my printer installed and working, all the multimedia support I need and I had already configured the remote of my VDR box 😉 . It seems Eclipse 3.4 and better webcam support will be the most interesting new features for my use. Plymouth with kernel modesetting looks great but none of my Intel and nVidia (nouveau) hardware has KMS support yet so I’m still seeing the dull blue bar or the traditional init messages. I’m keeping my hopes up though, especially for the intel driver. By the way, thanks to the RPM Fusion people for setting up the new repository! Olemme avanneet suomenkielisen Fedora-keskustelualueen Linux.fi-foorumien alaisuuteen. Suora linkki sinne on http://linux.fi/foorumi/index.php?board=16.0. Tervetuloa keskustelemaan kaikesta Fedoraan liittyvästä! Kiitokset Linux.fi-sivuston ylläpitotiimille foorumin pystyttämisestä. Suomalaisilla Fedora-käyttäjillä on myös IRC-kanava #fedora.fi IRCNet-verkossa. In short, we’ve started a Finnish Fedora discussion forum under the Linux.fi forums. The direct link is http://linux.fi/foorumi/index.php?board=16.0 (the forum is of course completely in Finnish). Thanks to the Linux.fi admin team for setting up the forum. The Finnish Fedora users also have an IRC channel, #fedora.fi on IRCnet. Helsinki is the only city in Finland which has a metro system (or a subway, which may be the more common name for it). At the same time it’s apparently the most northern metro system in the world. I use the metro quite often, but I’ve never seen the info screen system booting myself. Although these days you could probably assume that a lot of these types of systems actually run some sort of Linux distribution anyway.